Chautauqua was an adult educational program established in 1874 by leaders of the Methodist Episcopal church on the shores of Lake Chautauqua, N.Y. From this base, programs spread to many parts of the nation where, for a week or so in the summer, benches and large tents were erected for afternoon and evening programs. Initially formed to train Sunday school teachers, the Chautauqua program quickly expanded its objective and attracted a wide following to its correspondence and university extension courses and "great books" discussion programs. By the early years of the twentieth century and into the 1920s, these programs were being presented in many North Carolina communities. People gathered in a resort setting for classes, lectures, musical programs, and other forms of instruction and entertainment. Prominent lecturers, preachers with national reputations, and noted musicians, actors, and magicians appeared throughout the state. The Chautauqua program was often the entertainment and intellectual highlight of the year for many North Carolinians who had little disposable income to spend on such pursuits. The term "Chautauqua" actually originated in North Carolina. It had been the name of the Tuscarora Indian village where the town of New Bern arose following the arrival of Swiss settlers in 1710. Tuscaroras who migrated to New York soon afterward took the name with them. Lida Tunstall Rodman, "The Name Chautauqua of North Carolina Origin," Daughters of the American Revolution Magazine 47 (July 1915). John H. Vincent, The Chautauqua Movement (1886). Powell, Lew. "Pictures from an Institution (Chautauqua, that is)." North Carolina Miscellany (blog). Posted August 13, 2010. http://blogs.lib.unc.edu/ncm/index.php/2010/08/13/pictures-from-an-insti...(accessed June 26, 2012). Wilson, Linda D. "Chautauqua." Encyclopedia of Oklahoma History and Culture. http://digital.library.okstate.edu/encyclopedia/entries/C/CH010.html (accessed June 26, 2012). 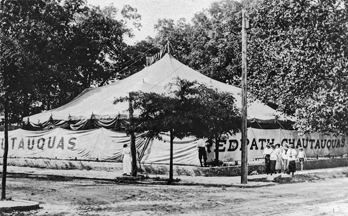 Tent of the Redpath Chautauqua at Goldsboro, ca. 1915. North Carolina Collection, University of North Carolina at Chapel Hill Library.